The dollar has rallied sharply since mid July. Technical trader Adam Hewison, over at INO.com, has had a buy signal since June. As I'm writing, the US Dollar Index (DX-Y.NYB) has made a new intra day 52 week high. It's back at levels not seen since September 2007. 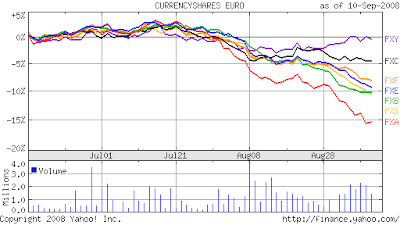 The Euro, Pound, and other currencies have of course gone lower. The Yen seems to be the only one holding up. The recent strength in the US dollar, if it continues, may impact the future earnings of US multinationals deriving a significant portion of their revenues from abroad. Just as the falling dollar has helped earnings in the past, its continuing rise can hurt. Coca Cola (KO): Last quarter, the weak dollar contributed 9 percentage points to the company's revenue growth. Du Pont (DD): 62% of 2007 sales came from abroad. Last quarter, currency exchange contributed about 5 percentage points to sales growth. General Electric (GE): 51% of 2007 revenue came from abroad, 54% last quarter. It's estimated that within the next couple of years this will rise to 60%. McDonald's (MCD): 65% of 2007 revenue came from abroad. The firm's European sales are now higher than US sales. Pepsi (PEP): 44% of 2007 revenues came from outside North America, as did 35% of the profits. Pfizer (PFE): 52% of 2007 revenues came from outside the US. The weak dollar contributed 7 percentage points to the drug maker's earnings growth last quarter. Philip Morris International (PM): All the firm's sales come from outside the US. Until its recent purchase of Canada's Rothmans, it didn't have sales in North America. Eleven percentage points of the cigarette maker's revenue gains were the result of the weak dollar last quarter. Procter & Gamble (PG): So far this year, foreign revenue accounted for 56%. Last quarter, the falling dollar boosted sales by 6%. Companies that trade on US exchanges but are incorporated abroad may also be affected by the dollar's rally. For instance, a rise in the dollar against the British Pound can drive Diageo (DEO) shares lower. 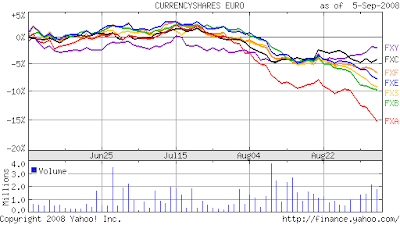 Any negative effect on multinational shares is probably temporary. The dollar's rise is not expected to last. Most analysts seem to view it as a bear market rally (this can change, of course, with growth slowing in emerging countries and Europe facing the possibility of a recession). US Unemployment continues to go up (I don't buy the explanation that it's because of the benefit extension--the rate doesn't include people who have run out of benefits and are still looking for work), housing prices continue to fall, and the US is still spending like crazy on Iraq. Deficits continue to rise. There's even a (growing, but still small) possibility that the dollar's reign as the world reserve currency will come to an end. I've noticed that terminally ill people often seem to get much better shortly before they die. The dollar looks that way. If you're investing on the US exchanges in a company that has a large portion of its revenues coming from abroad, keep an eye on the US dollar. Disclosure: At the time of writing, I own GE, PG, and PM. I'm happy that PM has recently raised its dividend by 17.39%. I bought to close three Evergreen Solar (ESLR) Jan '10 5 calls for $2.95. I sold them back in August for $6.40. That's a profit of $3.45 per contract. Of course, I'm down on my underlying shares. My cost basis is $9.34. With ESLR trading around $6.29 a share, I'm up around $0.40 a share on paper. Solar stocks tumbled today. As I'm writing, First Solar (FSLR) is down around 9.25%, Suntech Power (STP) is down around 10.8%. My own ESLR is down 16.54%. All these stocks have been falling the past few weeks. The alternative energy industry is in a precarious state, as I commented in August. Today's huge drop looks a bit silly to me. According to a Lehman analyst, as reported by the AP, "the recent solar sell-off seems to have been partly triggered by an overall market and commodity sector drop and a misinterpretation of some recent comments made by a solar executive." Old news is apparently being treated as something new. I'll be looking for ESLR to rebound, at which point I'll sell some more calls. I was going to roll my calls when the Jan '11 LEAPs were available, but I just couldn't pass up the opportunity to lock in my call write profit. Congress will hopefully get its act together and renew the alternative energy tax credits later this month. Welcome to the September 8, 2008 edition of Simply Investing blog carnival. Joe Manausa presents 3 Bogus Real Estate Statistics - Know Them Or Be Burned By Them posted at Really Better Real Estate, saying, "There is a disturbing habit of our recognized industry leaders to quote statistics that have no basis at all. Some of them are downright wrong! This article will recognize three of the most important bogus real estate statistics that everyone ought to know about." Tushar Mathur presents Your Future without Debt! posted at Everything Finance, saying, "There is a lack of financial and investment education in our schools. Here is some advice on investing or saving for retirement." KCLau presents What Do You Know About Bankruptcy? posted at KCLau's Money Tips, saying, "an article on how one becomes bankrupt and how to be discharged from bankruptcy." Ned Carey presents What Should Be In Your Library? posted at Baltimore Real Estate Investing Blog. The author reviews motivational, sales and marketing, business and finance, and real estate books. Praveen presents How Markets React to Fundamentals posted at My Simple Trading System. "[T]rying to time the market based on fundamental information [can be] very tricky. Not only do you need accurate, timely information, but you have to 'out think' other market participants." Michael Cintolo presents Emerging Markets Q&A posted at The Iconoclast Investor. Q&A with Paul Goodwin at the Money Show. imarketing4s presents What to Ask a Credit Counseling Agency posted at Free Debt Consolidation: Qualified Financial Management. "If you have decided to seek help from a credit counseling agency, never presume that all agencies have your best interests at heart...In this article, we present the questions that you should ask a credit counseling agency before hiring their service." Silicon Valley Blogger presents You've Got Money: Invest It All or Dollar Cost Average? posted at The Digerati Life. The author discusses three popular investment timing strategies: lump sum, value cost averaging, and dollar cost averaging. Ben Dinsmore presents Contributing More to Your 401k Is Not as Difficult as You May Think posted at Trees Full of Money, saying, "If you don't think that you can afford to contribute more money into your 401k plan, you NEED to read this article!" AndrewB presents You Think Making More Money or Losing Weight equals happiness? Think Again posted at Personal Hack, saying, "In this article I discuss the relationship between happiness and making more money." Kacper Wrzesniewski presents Why did I invest so little? posted at KacperWrzesniewski.com, saying, "It is very common that after successful picking a stock an investor is asking this question. This feeling that you could invest more and now enjoy much bigger earnings appears and it is difficult to free your mind from it." Tushar Mathur presents Advantages and Disadvantages of ETFs posted at Invest In India, saying, "ETFs are mutual funds, whose units can be bought and sold on the stock exchange." Upside Trader presents Hey, Maybe I'm Wrong posted at upsidetrader, saying, "I'm the biggest financial bear on the planet as you all know. Najarian is talking about the off the charts call option action in the financials today, and I do have to "respect" bullish action in any group when it presents itself." FIRE Getters presents U.S. Economy Grounded? Think Again posted at FIRE Finance. The authors compare stock market loses around the world, and find that "US stocks appear to be the one of the few bright spots in a gloomy world economy." The Shark Investor presents Alternative Income: Selling Illustrations, Photos or Videos posted at The Shark Investor. The author provides tips and hints on making some cash on the side by selling images. Ralph Jean-Paul presents 15 ways to save money during a recession posted at Bugs Munny, saying, "Investing money wisely should be a practice that you are taking part in whether the economy is good or slow. Here are some ways you can save some extra bucks so that you still have the opportunity to use your money to grow your wealth." Tammy Powell presents 2 Absolute things to avoid in buying rental properties posted at Enlightened Wealth Institute student Tammy Powell. "Here are two must do tips on avoiding sitting on a cash sucking real estate investment." Livingalmostlarge presents Drunken Wall Street? posted at LivingAlmostLarge. Politics and US debt. Ace Elliott presents Avoiding Mortgage Foreclosure posted at Care on Credit, saying, "As the home mortgage market sways find out what you can do to anchor yourself and weather the foreclosure storm." sti presents Economic Data That Influence the Market | Stock Trading Ideas posted at Stock Trading Ideas. The author explains "some of the commonly used economic indicators that can influence the general direction of the market." The Hoss presents Shares, What are They? posted at Hoss Cents Free Financial Money Magazine, saying, "The Hoss explains in layman's terms various stock types and how and how an investor can profit from each." The Stock Teacher presents Short Squeeze On The Horizon For Luby?s (LUB)? posted at Stock Investment, saying, "Could good quarterly earnings spark a short squeeze among Luby's shares?" Robert D Flach presents THE FEELING IS DEMUTUAL posted at THE WANDERING TAX PRO. The author discusses Fisher v. US, a recent case where a court ruled that the cost basis of stock received by insurance policy holders is not $0. This may entitle (depending on when they received the shares and whether they filed the appropriate paper work) recipients to a tax refund.